Blossom blight (caused by Monilinia fructicola that also causes brown rot on fruit) on peaches is more common this year than in most years. The bloom period this year has been very extended; several weeks to more than a month for some varieties. This coupled with the frequent periods of rainfall has created optimal infection conditions normally not seen. With crop failure in some orchards in 2018, there was reduced or no fungicide sprays applied. This also was coupled with small fruit that froze but did not drop thus serving as sources for brown rot to occur and provide inoculum for the 2019 season. In North Carolina, the major concern with blossom blight is that it provides a source of inoculum for “green fruit rot” during the growing season and “brown rot” at harvest time. Of course, the occurrence of these rots depends greatly on the weather conditions for infections to occur. A continuation of frequent periods of precipitation and especially during the 2-3 week period as fruit ripen can result in severe brown rot. There are some excellent fungicides for use in the pre-harvest period (see peach spray guide). What to do now? Scout the orchard to see if blossom blight has occurred. Look for blossoms that have remained attached to the twig (picture attached). There is usually a dead area (canker) on the twig under the blossom that can extend an inch or so along the twig. 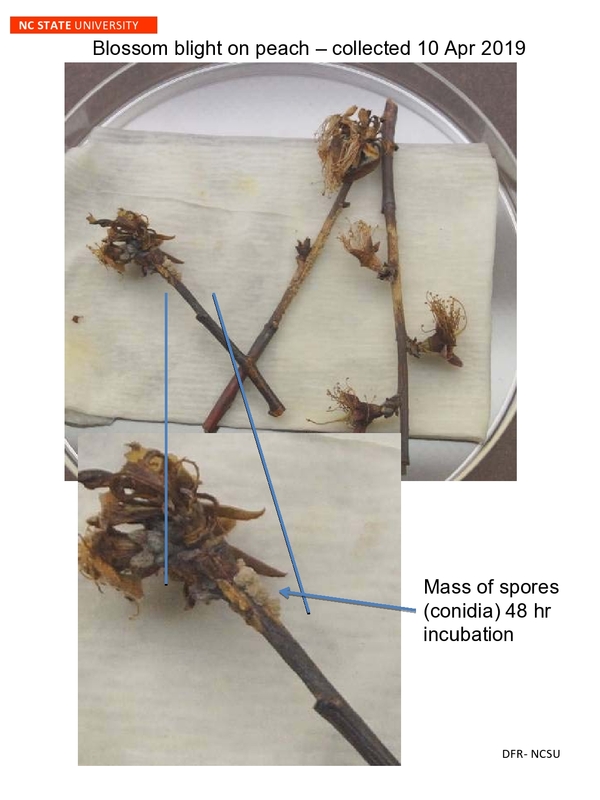 The flower parts remain attached to the twig and are a tan-brown color often with masses of dried fungal spores (conidia) on the killed plant parts. Removing and placing the killed tissue on a moist paper towel in a closed container usually results in sporulation occurring in 24-48 hours. This can help confirm that it is blossom blight. If blossom blight has occurred, it is important that a good cover spray program be followed. Normally cover sprays are applied on a 10-14 day schedule How rigorous will depend on the frequency of precipitation. Fungicide cover sprays are usually captan and/or sulfur. Captan is more effective than sulfur particularly when precipitation is occurring frequently (at least once a week). Preventing insect injury or other types of injury (wounds during thinning) to fruit is critical in preventing green-fruit rot. Avoid using a fungicide in cover sprays that will be used in pre-harvest sprays to reduce risk of resistance. Maintain a good disease and insect control program in the cover-spray period and be vigilant as fruit ripen observing the weather conditions in the 3-week preharvest period for each variety. The 2019 NC Peach & Nectarine Disease and Pest Management Guide may be found at the Peach website in the Production & Management section.